• Light Up the Stage over the 1 Forked Bolt . (Mana is really tight, but the card selection could be worth it -- on the other hand, bolting "birds" is very important :). So far the only one I'm immediately considering switching is #2. #3 will require testing and I'm sure is more meta-dependent because I don't think there's a flat-out better choice between the 2. It may just end up needing to be a "flex" creature slot. I'd drop Become Immense for lands. Actually, I've never thought of using any of those "block me instead" kind of creatures. I put together this list thinking that I'd either win in the first three turns, or scoop, haha. I'm fond of Seal of Strength because I don't need to enchant a creature, but I'll think about adding Briar Shield in. I thought about adding Phytoburst or even a single Become Immense but I feel that the trample from something like Predator's Strike would be much more flexible. Not sure how I feel about revealing my hand, but I do like the idea of having stuff like Scent of Ivy and Land Grant though. Spider Umbra seems strictly worse than Vines of Vastwood . 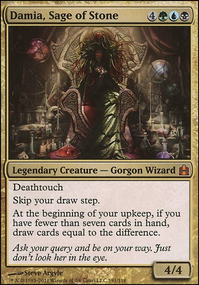 I'd also drop 1-2 Rancor (bad against Control) for 1-2 more Become Immense . Your mana base is a little weird too. I'd run 8 fetches and 4 Inkmoth Nexus . Not sure if the current mana base reflects budgetary concerns. And drop 3 Forest for the three additional lands I mentioned. First of all, thanks for your comment ! I've always liked Infect but never was a big fan of the usual aggro/combo variant. So i played a Mono Black style since a long time because i love Phyrexian Crusader and think it can be a very efficient win-con in Modern. 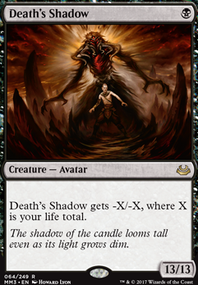 B/G should be the way to go but i'm pretty sure a Rakdos variant could have decent results : casting Anger of the Gods when you have a Crusader on the board is pretty enjoyable and Blood Moon is still a thing in Modern. Still not sure about the non-inclusion of Inkmoth Nexus , but i never missed them. 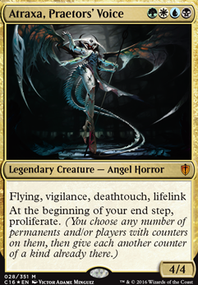 I also want to keep the colorless lands at their minimum because of Anger of the Gods and because i wanna keep two Cathedral of War as they turn Phyrexian Vatmother , Skithiryx, the Blight Dragon and an equipped Phyrexian Crusader into a two turns clock. I love Phyrexian Arena and would like it to works, but Night's Whisper comes a turn earlier and it makes a big difference IMO. itachi45, High Counsel of Jin-Gitaxias, coming in for a comment. I like a lot of what you have going on here, but I think those could use a little tidying up. One of the biggest draws to the most recent Infect lists is they operate almost entirely at instant speed for full flexibility. For that reason, I think you have entirely too many sorceries in this deck. 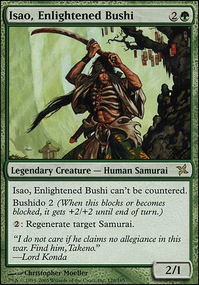 I’d switch your 12 sorceries for 4x Blossoming Defense , 4x Mutagenic Growth , 3x Become Immense and 1x Apostle's Blessing . Good to see another player spreading the work of the father of machines! If you really looking to make this as competitive as possible, I will refer you to my personal list that I use, Brother, That Looks... Infected. My list isn’t really optimal, since I’m using birds of paradise instead of noble hierarch, but other than that it is as competitive as it gets. 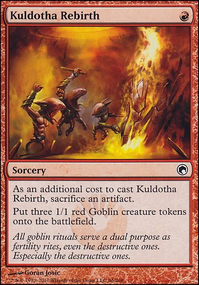 My three biggest card suggestions I could make would be 3 copies of Become Immense , 4 copies of Might of Old Krosa , and 4 copies of Inkmoth Nexus . Here’s Aaron Barich’s Infect Invitational Winner 6/10/18 that he took 1st place with. If you have any questions or comments, feel free to reply! Thank you both for your input. I'm updating the deck to include some of your suggestions immediately. 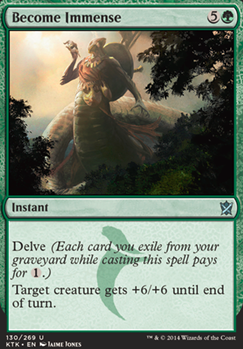 What do you think about going with 19 lands in order to add a single Become Immense or Revenge of the Hunted ?